Please note that Cider Barn, The Piggery and The Oxen House are Saturday changeover and The Stable and the Granary are Friday changeover. All prices are inclusive of Electricity, Central Heating and Hot Water and are stated in GBP (£). Short breaks are available during the weeks shaded darker in the tariff - minimum stay 3 nights. 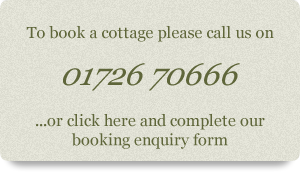 During other times a short break can sometimes be taken up to 10 days prior to arrival, if a cottage is available. Prices are 20% of the weekly rate per night.